Pattern is Piper's Journey; yarn is Tosh Merino Light in Mandala (the purple/blue) and Begonia Leaf. Mandala is a new colorway for Madelinetosh and I love it so much! I chose it for the body and then found the Begonia Leaf for the lace, which brings out the subtle pinks in the Mandala. This wasn't a Christmas knit, but rather, a treat for me, once I'd finished my gift knits. This cowl has been made nearly 15,000 times according to Ravelry, but it's usually in one solid color. Well, I wanted mine to be different, so I planned on doing a three-stripe, using an entire skein for each stripe. Luckily, I listened to my inner voice when I was nearly finished with the second skein, because adding that third one would have made it too bulky for my body. This is meant to wear doubled - you can see in the one picture how long it is. 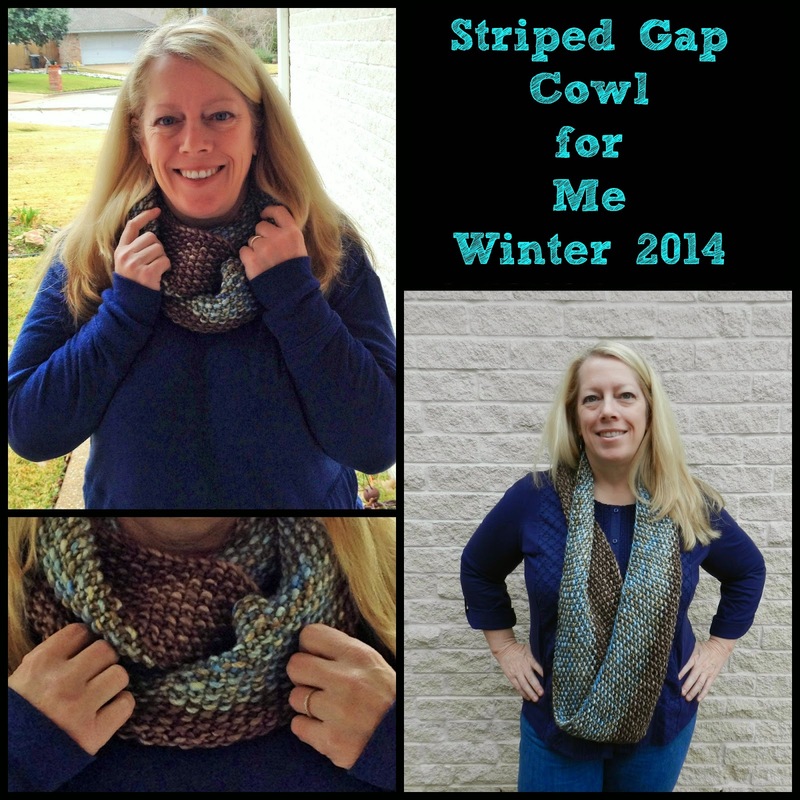 I have to say, I LOVE LOVE LOVE this cowl and have worn the heck out of already! It's so soft and squishy - I can't stop squeezing it! Pattern is Gap-tastic, yarn is Madelinetosh A.S.A.P. in Cove and Weathered Frame colorways. Just when I thought I was finished with my gift knitting, our dear bloggy friend Biz lost her beloved husband. Being so far away, I couldn't give her a hug in person, but I could send her one. So I made her a Gap-tastic cowl. Being that I wanted to get started on it right away, I bought the yarn at a craft store in town and went to work. I finished it in one week and got it mailed off just in time for Christmas. Her favorite color is blue, but I decided on making it in a neutral color so it would go with every blue instead of competing with whatever she wore. Yarn is Lion Brand Wool-Ease Thick and Quick Solids, colorway is Fisherman. Not gonna lie, I still get a thrill seeing myself in a magazine, no matter how small! Well, I'm as ready as I can be for the race(s) this weekend...oh, did I mention we're doing the 5K on Saturday, as well as the half marathon on Sunday? Somehow that seemed like a good idea several months ago, when we signed up for it. I'm just going to take it super easy on that 5K, but the cool thing is that we'll get a medal for that race, and then of course a medal for the half marathon, and then a third medal for doing both races...which might have been why we signed up for that 5K. It's going to be a fun weekend with our running friends and I can't believe it's almost here! I'll be back on Monday with a recap of the half marathon. I wonder if it will be online later?! Love the knits you made! They are all gorgeous! Congrats on the interview! You have inspired me as well as so many others. So glad you are receiving some great recognition. Wow! 2 races back to back! Very ambitious, but you got this. Good luck and I hope you have great weather for them both. Congrats on the article! Woo Hoo! It's nice that they included your blog so it gets you traffic, too. Good luck with the races, but you are well trained for them. I have to admit to a twinge of jealousy about you being outside this time of year LOL! 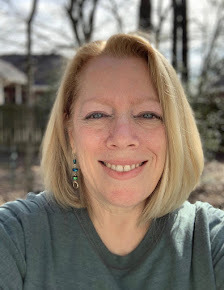 It's rare when I can't run outdoors (although I am willing to run in really cold temps and rain, so you'll have that). Well hey!! I would too that's soooo cool!! And, love the knits. You are talented!! Working on a hat right now--simple but fun! You have become quite the talented knitter Shelley. Did they mention your knitting in the magazine article? It should have been as it's how you recover from racing lol! Have fun this weekend - looks to me like you're going to have nearly ideal weather conditions. Can't wait for the recap! I'm hoping the weather forecast holds, as it's looking really nice right now! 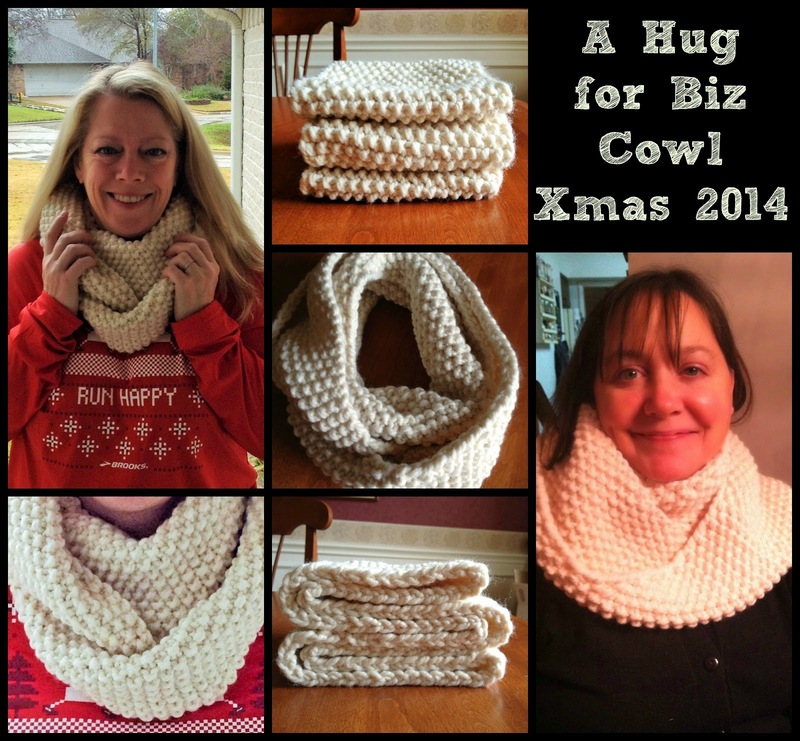 I love my cowl! You know I normally don't wear a coat, but I will wear that cowl in the car on the way to and from work - keeps me toasty posty! Congrats on the magazine - too cool! And I know you'll do just fine this weekend - can't wait for the recap next week. So exciting to be in that magazine article! Yay for you and yay for blogging! I love all your knits! 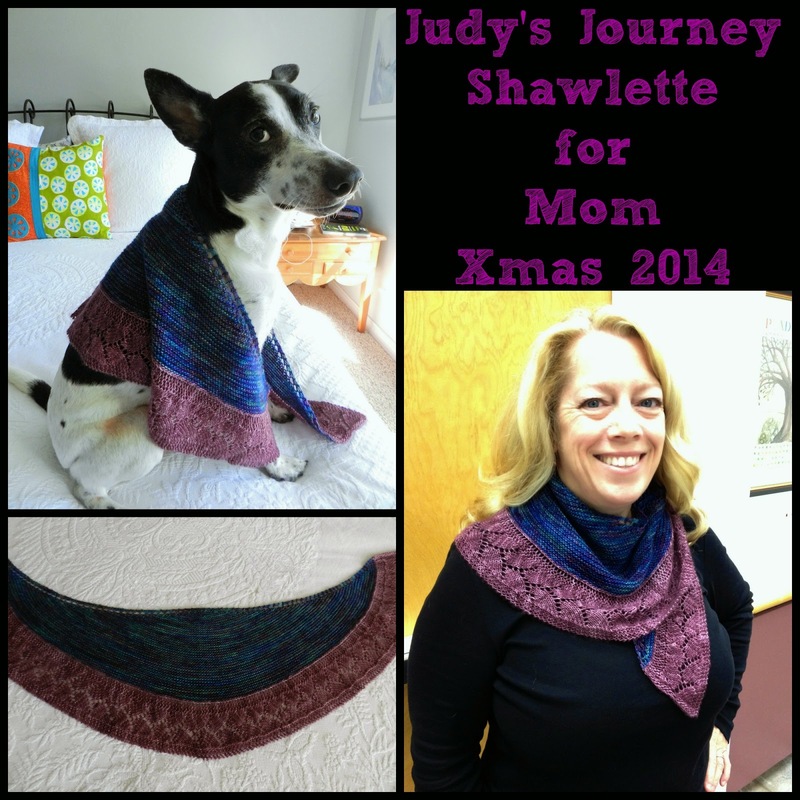 Did you mom like her shawlette? It is beautiful--colors and stitches. And you know I love the seed stitch. I think I'm gonna cast on for that one today. I like your photo collages--so pro! The photo collages are fun to make - I use PicMonkey. Really, I'm just trying to save everyone from massive picture overload on these posts (although sometimes I just can't resist posting a ton of pictures with captions on each...it's a sickness, LOL). How cool you are in those magazines! Totally deserved! The knitting projects all look great. Have fun this weekend, I will definitely be thinking of you and cheering for you across the ocean. That is SO awesome that you are in a magazine. Just imagine how many people are going to be inspired by you!!!!! Great Shawletts too, so beautiful! Cool magazine spread!! Love it! Love all the knitting projects, Shelley, and that you treated yourself with one, too. Congrats on the article and best of luck on both your races - I've never done back to back races before, but the bling will be awesome! Your knitting projects are so beautiful. I love them all. I guess your weather is currently cowl weather.